Lightning flashes in the sky, fireworks boom, a hunter's gunshot echoes in the distance, or a Hoover vacuum motor hums. How does your pet react to these common noises? Noise phobias are more common in dogs than cats, but both do experience noise phobias. 50% of dogs experience some type of noise fear. Some pets hide and tremble, pant heavily, pace or circle, vocalize (bark, meow, whine), house soil, chew themselves, or destroy their surroundings by eating furniture, scratching doors, cling uncontrollably to their family members, or try to escape by digging or jumping through glass windows or running away to try to escape from the noise which can result in lost pets or pets hit by cars by escaping from their yards. How do noise phobias develop? Sometimes a particularly bad experience with a noise can lead to a noise phobia, but sometimes no triggering event can be identified. Often the fear of noises escalates over repeated exposures to the same stimulus. Dogs do not outgrow noise phobias; they often worsen over time. Also, over time pets can become fearful of similar sounds or other variables associated with sound. For example, a pet afraid of fireworks. May also be afraid of a gunshot. A pet fearful of the sound of thunder may become fearful of the flash of lightning, the sound of wind or rain, the change in barometric air pressures, the static electricity in the air, or the odor of ionic changes in the air that often precede a storm. Remember, that an animal's senses are far more sensitive than humans and animals often know a storm is on the way long before we do. Even if your pet may be experiencing mild behavior changes, it is important to intervene now. Note that sometimes noise phobias can be difficult to recognize because sporadic destructive behavior or house soiling may actually be a noise phobia; i.e. you come home to find an "accident" or furnishings destroyed for an apparently unexplained reason. These guidelines are also helpful even if your pet is experiencing moderate fear. If severe signs, please consult a doctor of veterinary medicine who specializes in animal behavior. 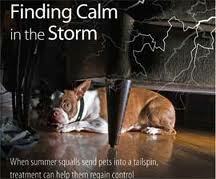 In severe cases, desensitization (Techniques where a pet's negative response is decreased while your pet is exposed to increasing levels of the fear stimulus and being rewarded for being calm) can be used under professional guidance using a thunderstorm cd in the wintertime when there is no natural occurrence of thunderstorms. Counter conditioning ( when a pet exhibits a desirable behavior such as a calm behavior rather than an undesirable behavior like trembling as a response to a certain stimulus as a storm, the pet is rewarded with a toy stuffed with food) can also be used. Therefore, a negative stimulus (thunderstorms) may become associated with a dog's favorite toy stuffed with food. You can take these measures at home and consult your veterinarian about the following guidelines. Create a "safe haven" for your pet where your pet is insulated from the sights, sounds, and vibrations of a storm. On their own, often a pet will retreat to a closet or hide underneath a bed. If our pet does not find a spot on his own, create one, Cover a dog cage, (always leave the door open), with a blanket or even a blanket in the bath tub because pets may feel less static electricity because of the porcelain. Close curtains or use light blocking blinds and play TV or music to distract your pet. Turn on all lights in the room to equalize the lighting flashes. See thunderhut.com to create a safe haven. Talk radio such as NPR, classical music, or a white noise CD (www.purewhitenoise.com) can be helpful. The "white noise" of a fan can also help to drown out storm noise. Some pets may be tolerate ear plugs—-just make sure they do not ingest them. Calming cd's like those found at caninelullabies.com can be helpful. Pheromones can also be very helpful. DAP (dog appeasing pheromone) is a synthetic equivalent to a pheromone secreted by a nursing canine female and calms a dog by reminding him of safe puppy food: it comes in the form of collars, spray, and wall diffusers. There is also the Feliway which is feline facial pheromone that is helpful in reducing feline anxiety. Other tools include the Thundershirt (thundershirt.com), the Storm Defender Cape (stormdefender.com), and the Calming Cap. The Thundershirt can provide gentle constant pressure on acupressure points calming some pets to varying degrees. The Thundershirt must be fitted properly and used appropriately so consult your veterinarians. The Storm Defender Cape may be helpful if one of your pet's thunderstorm anxiety triggers is the static electricity in the air associated with storms. 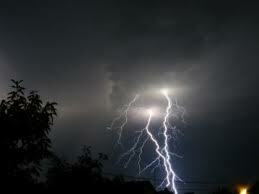 The Calming Cap may be helpful if the sight of lightning flashes is distressful to your pet. The use of quality supplements like anixitane (L-theanine) by VIRBAC can be helpful if used short or long-term. The supplement can be calming and administered during thunderstorm season and can also be prescribed by your veterinarian for other anxiety disorders. Prescription medications can also be prescribed by your veterinarian. Note: acepromazine is not recommended for tranquilizing fearful and phobic dogs. Acepromazine causes sedation but does not relieve anxiety; therefore if acepromazine is used a fearful pet will be very drowsy but still very afraid. Imagine if you were afraid of heights and tranquilized but not prescribed an anti-anxiety medication, and your are being dangled from a sky scraper—you may be too sedated to scream but still very, very afraid. These fearful and phobic feelings are what your pet feels too! There are short-term and long-term medications for your pet and can be used in combination if needed. Depending on the short-term medication, it may need to be given 30-45 minutes prior to a storm occurring but you also need to monitor weather reports. If there is a 50% chance or greater of a storm occurring while you are at work, you may need to administer a short-term medication prior to leaving in the morning or when you come home for lunch. Be kind to your pet and consult an informed, skilled, compassionate veterinarian to help your pet. The degree of success of managing your pet's fears and phobias depends on your access to expert advice, the pet owner's dedication to the behavior treatment plan, and the severity, duration, and frequency of the fear or phobia. I loved the article on fish; it had taken me a while to find this site but I must say that it is really helpful! The article about animals really answered some of the question I had about the topic. Thanks for the post on animals. It was exactly what I was looking for. Good introduction and a good comprehensive article about puppies. Great article about dogs. I'll recommend this to my friends. Good read and a great article. Thanks for the information on cats. Precisely what I expected for this blog. Great post about dogs. Nice work on puppies. It was informative and good. I came here looking for a good article and found exactly what I was looking for! Good post about turtles. Definitely worth the read. Great post on parakeets. This is the quality that I expect from such a great blog. Good post about animals. Nice work on the post on turtles. Good read. Thanks for the nice puppies article. Thanks for the great article about cats. It was well written and belongs on this great blog. Excellent work on the post on turtles. I liked it. Great read about turtles. I loved the article on pets. It was very good. I couldn't find an article on puppies like this one anywhere else. Thanks for the information. That article on rabbits was great! Excellent article about turtles. Thanks for the writing. I stopped by here when I found the blog on Google; great work with the article on turtles. Good writing, good content, and good quality with the article about puppies. Excellent work on the article on pets. I'll recommend it to my friends. turtles is a good topic, and it is nice to see it cabouted so well. This is just what I was looking to read. Thanks for the article about cats.